The best way to get to know Elms is to visit. Come take in the beautiful rolling hills of Western Massachusetts, walk through the halls of our charming buildings, and say hi to the friendly faces around campus. You’ll find our community welcoming. 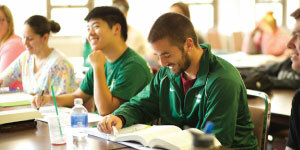 Register for a visit at elms.edu/visit. Elms College is a Catholic liberal arts college founded over 90 years ago by the Sisters of St. Joseph—a group of women dedicated to providing an education rooted in a commitment to neighbor and justice, and open to those of all faiths. Today, in the spirit of the Sisters, Elms College continues its mission to provide a learning community committed to unity and social justice. We embrace and respect all people and cultures, and the planet, so that together we may effect positive change in our world. At Elms, we educate with a purpose: to instill in our students the passion and drive to leave this world better than they found it, and to help our students find what impels them to make a positive difference and take action. We encourage our students to become the best versions of themselves. An Elms education is about more than just career preparation; it’s about developing our students’ character, intellect, and spirit. 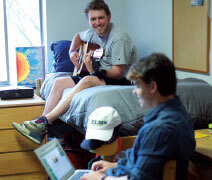 We are a close-knit community, guided by the College’s values of faith and excellence. Located in the heart of New England on 25 acres in the historic district of Chicopee, Massachusetts, our scenic campus features state-of-the-art classrooms, laboratories, learning centers, and student-life facilities. These include a 22,000-sq. ft. Center for Natural and Health Sciences, the Alumnae Library Learning Commons and Student Success Center, historic and modern residential spaces, college center with Elms Starbucks Café, NCAA-compliant athletic fields, and the Maguire Center arena, with suspended running track, 25-meter swimming pool, aerobic center, weight-training area, and health and counseling center. We offer undergraduate, graduate, and continuing education programs in an environment that is values centered and progressive. In all fields you’ll find career-oriented majors, small class sizes (12–18 students average class size), and challenging curricula. The level of personal attention our students receive from faculty and staff gives them the support and confidence to succeed, and they do succeed: 100% of our Education graduates get hired, and 100% of BA/MBA Accounting majors from the Classes of 2014, 2015, 2016, and 2017 are employed in their field. Opportunities at Elms reach far beyond the classroom walls. Through study abroad, internships, and extracurricular activities, our students gain a wide view of the world and valuable skills for whatever career path they choose. Our students also lend a helping hand through service projects and mission trips—in our local community and around the world.